Bravo! Homestyle Complete Dinner is made from raw, freeze-dried meat or poultry. In addition, veggies, cranberries, vitamins, and minerals come with the food. All it takes is a little water to mix the ingredients into a healthy, premium meal. Your pups will devour this healthy food and nourishment. The main ingredient is either raw, freeze-dried meat or poultry. Freeze-dried natural meals include added vitamins, minerals, veggies and cranberries. No added hormones, antibiotics, artificial preservatives, flavors or colors. Formula provides a complete balanced and nutritious meal for dogs of all ages and breeds. Raw meat and poultry must be kept separate from other foods. Make sure to wash any surface or items you come into contact so you don’t spread bacteria. Utensils, cutting boards, preparation and feeding bowls should be washed in hot, soapy water. Beef, Beef Liver, Sweet Potatoes, Chickpeas, Beef Hearts, Green Beans, Cranberries, Dried Eggs, Tricalcium Phosphate, Choline Chloride, Dried Kelp, Tumeric, Salt, Mixed Tocopherols, (Proteinated Minerals and Vitamins), Rosemary Extract. 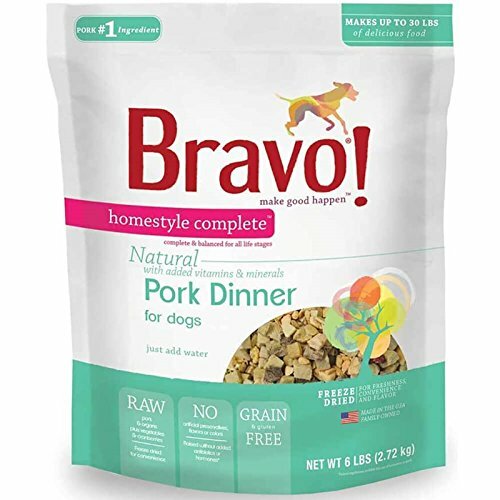 Bravo Homestyle Complete Freeze Dried Dinner Pork Food, 6 lb. Pet food ingredients, nutritional values, and the way they are labeled for consumers are monitored by several organizations in the United States including the Food and Drug Administration (FDA) and the NGO, Association of American Feed Control Officials (AAFCO). New food should always be introduced gradually. Ration the new meal into small portions and mix it in your dog’s old food. Keep increasing the amount of new food to old. Once the ration of new food becomes 3/4 more than the old food, feed your pup 100% of new food within two days. By slowly transitioning to the new food, you’ll ensure your canine’s digestive system does not get compromised. When preparing the food, make sure to add 1 cup of warm water to every cup of food. Let the formula soak for 15-20 minutes before you serve the meal to your little one. If you prefer to feed your dog a light broth, then add 1 1/2 cup of warm water to the food. Always add an equal amount of water to each serving. Bravo! Homestyle Complete Dinner is a freeze-dried food made from raw poultry or meat. In addition, the formula is made from grain-free and gluten-free ingredients full of nutrients and protein. All ingredients are supplied in the United States or outsourced to other countries except China. Moreover, Bravo! Homestyle Complete Dinner is made for small, medium, and large adult breeds. If your canine suffers from dietary problems, make sure to consult your little one’s veterinarian prior to making changes to your dog’s diet. You want to make sure raw products are good for your dog, and that he/she does not have allergies to any of the ingredients. 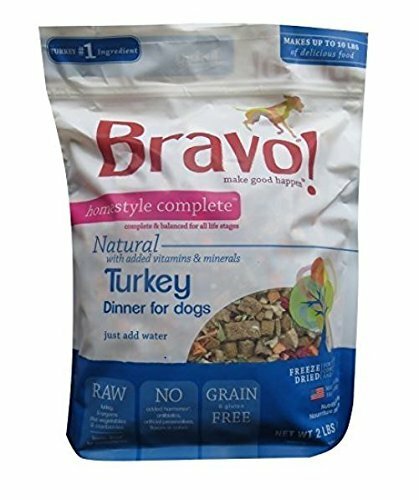 If your canine’s veterinarian agrees with a change to your dog’s diet, Bravo! Homestyle Complete Dinner might be a good start.